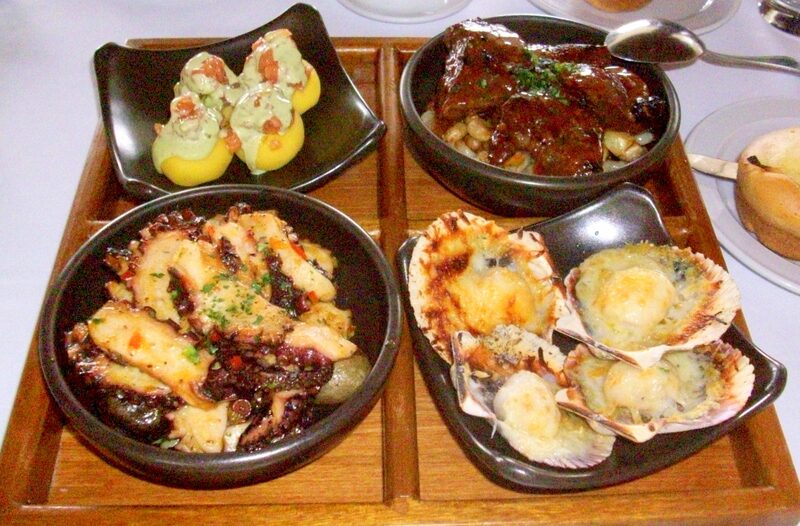 Lima boasts three of the world’s Top 100 restaurants, and for good reason. 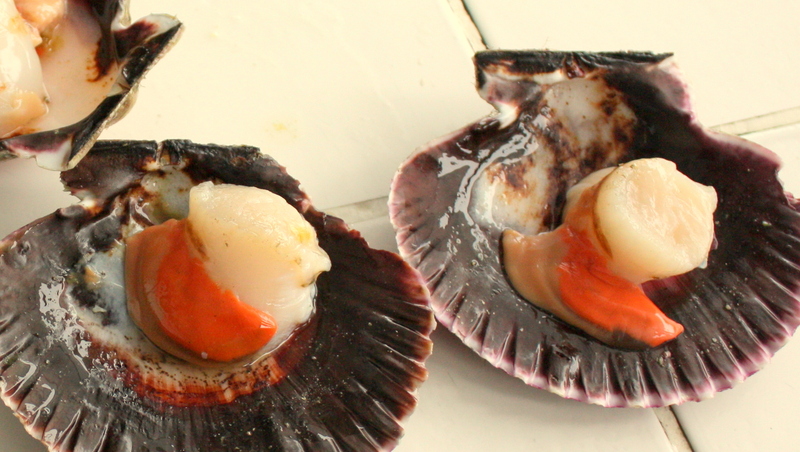 Top chefs have discovered Perú’s wide and distinctive selection of native fruits and vegetables, and fresh seafood, and are whipping up stunning menus with them. During my 13 days in Perú, I’ve run already run across some tasty and intriguing local delicacies, first among which is the ubiquitous quinoa, which appears in everything from soups and salads to crusted meats and even beer. I’ve also had a chance to try alpaca steak, Andes mountain trout, and the refreshing chicha morada beverage. 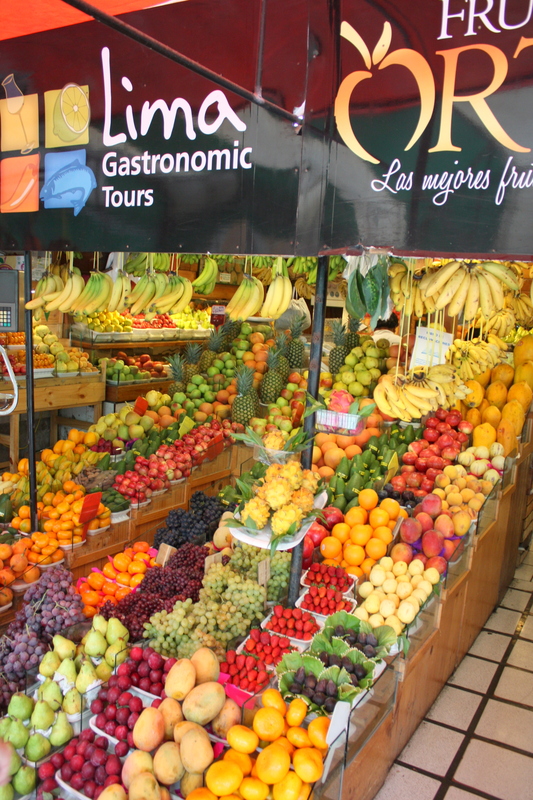 Today, though, is a foodie fantasy that takes us through the markets and kitchens of Lima to see, make, and taste some of their most popular offerings. 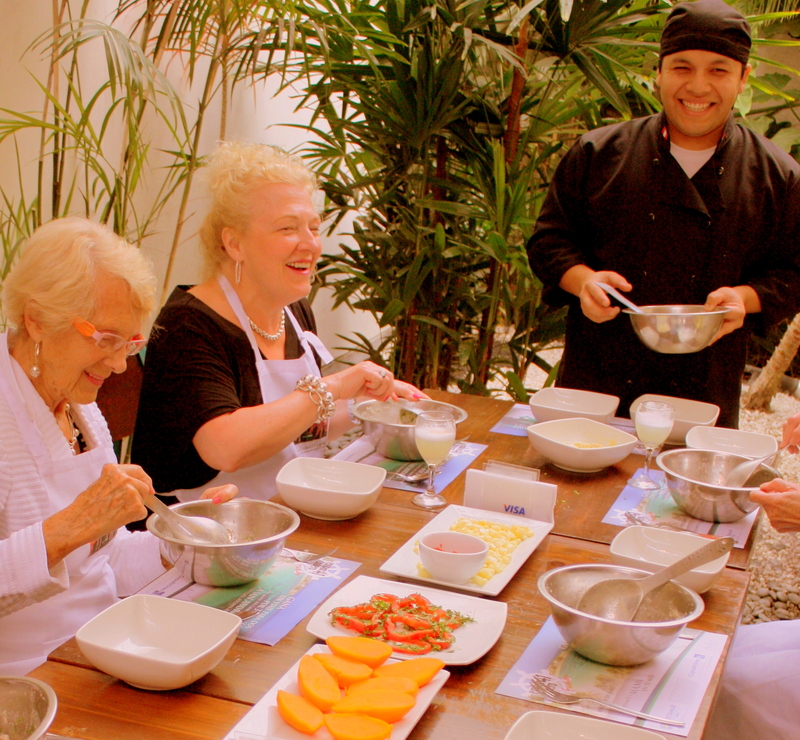 The tour is operated by the Lima Gourmet Company, and its foodie tour groups are restricted size to no more than eight persons in order to afford ample time to chat with vendors and chefs. 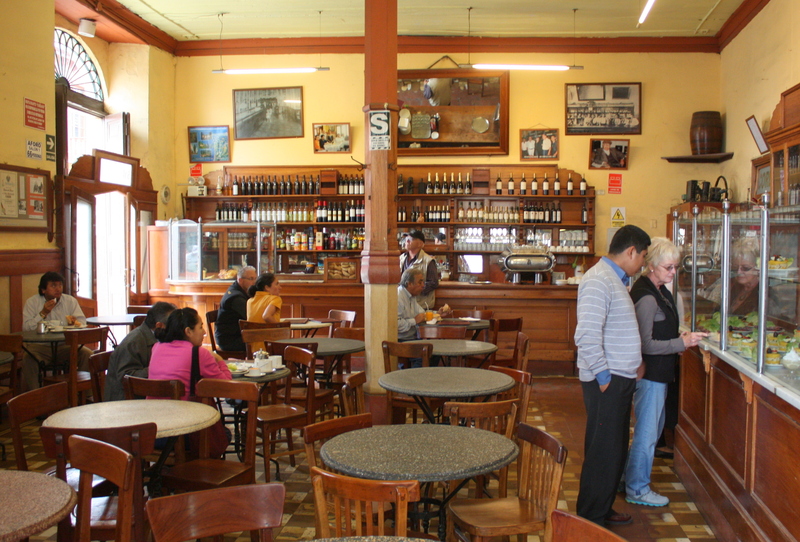 The day begins with coffee at Cafe Bisetti back in the Barranco District. The dining room is done in a sleek Euro style, but there’s a quaint Spanish colonial courtyard out back, and on the way to it we pass the room where nothing but organic coffee beans are being hand-sorted. 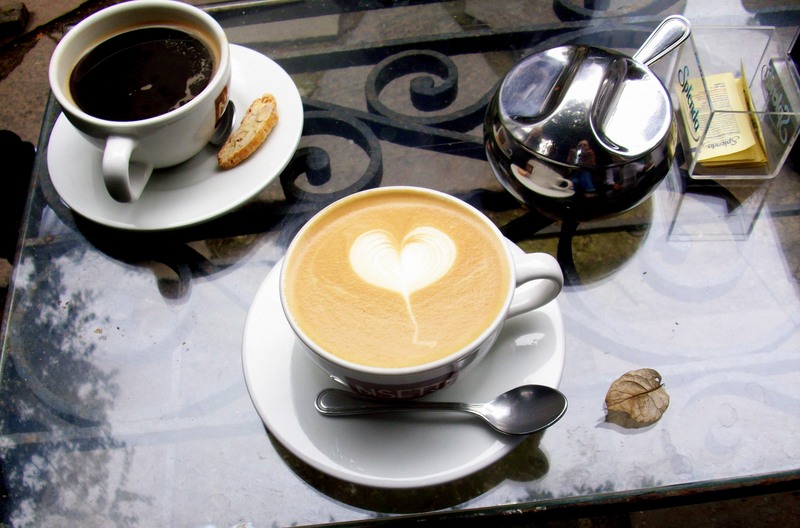 The latte looks almost too good to drink. This morning we’re drinking breakfast nearby at La Bodega Verde, which is well known for its lúcuma smoothies and shakes. They may look like plain vanilla, but the flavor is a delicate blend often described as maple +sweet potato. 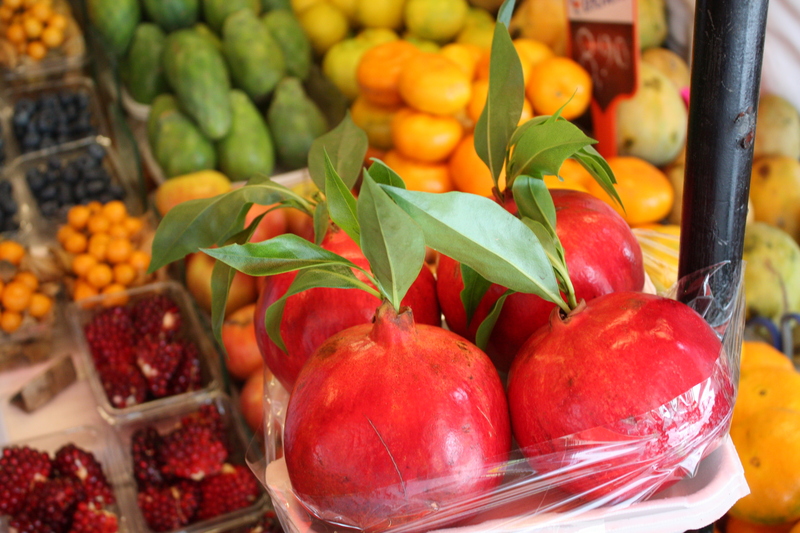 This nectar comes from Perú’s native lúcuma fruit, also known by the English name “eggfruit” because its flesh resembles a hard-boiled egg yolk in texture and color. Its use in Perú pre-dates the Incas, and is today is so popular that Starbucks has added it to the menu here. 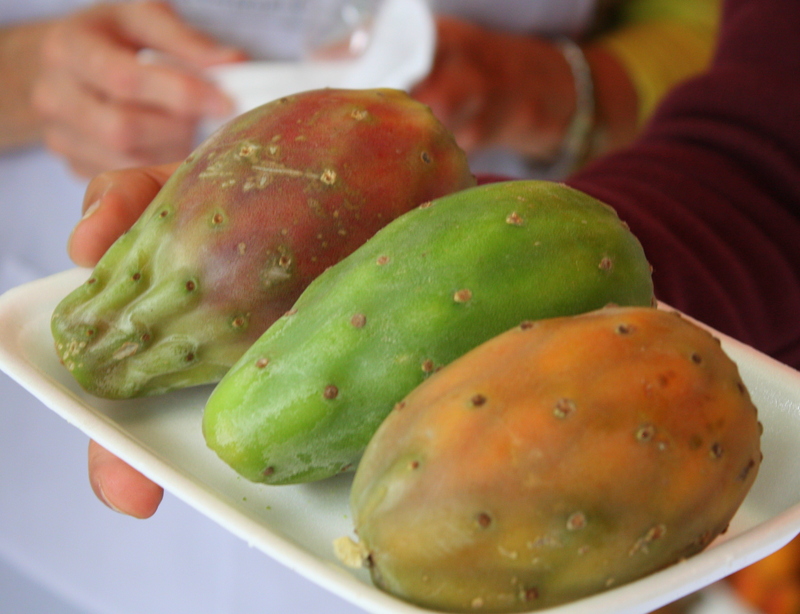 It turns out that lúcuma is not just about a great taste. It also packs high levels of B-vitamins and carotene. 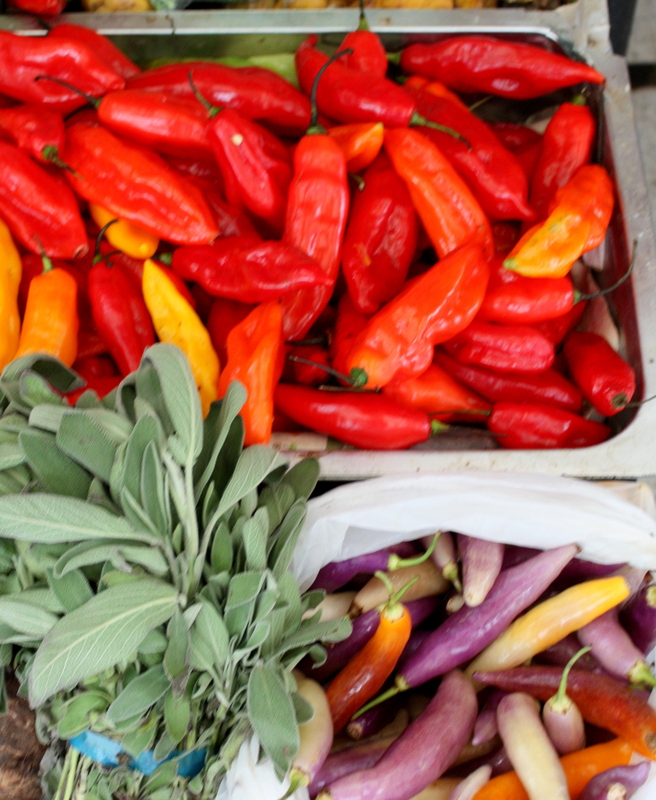 The San Ysidro Market is where the pickiest of chefs go each morning for the best and freshest produce and seafood. 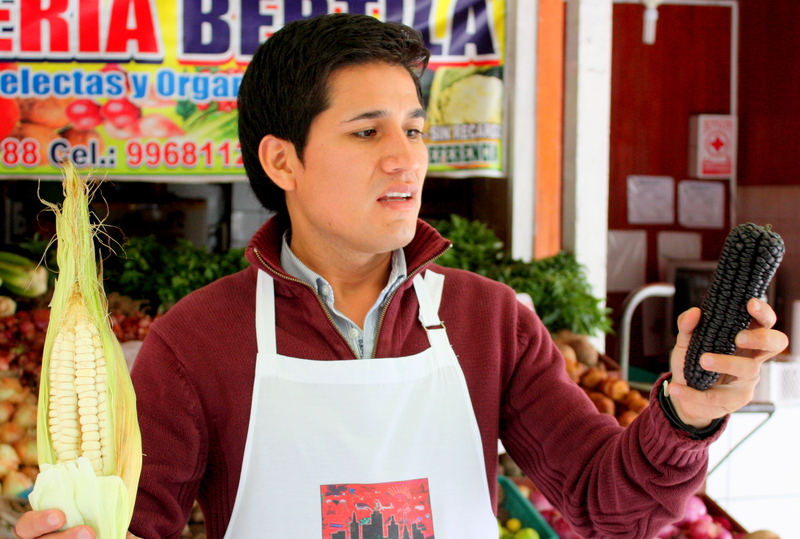 David walks us first through the stalls of the produce vendors, introducing us to tropical fruits and vegetables and giving us an opportunity to taste each one. 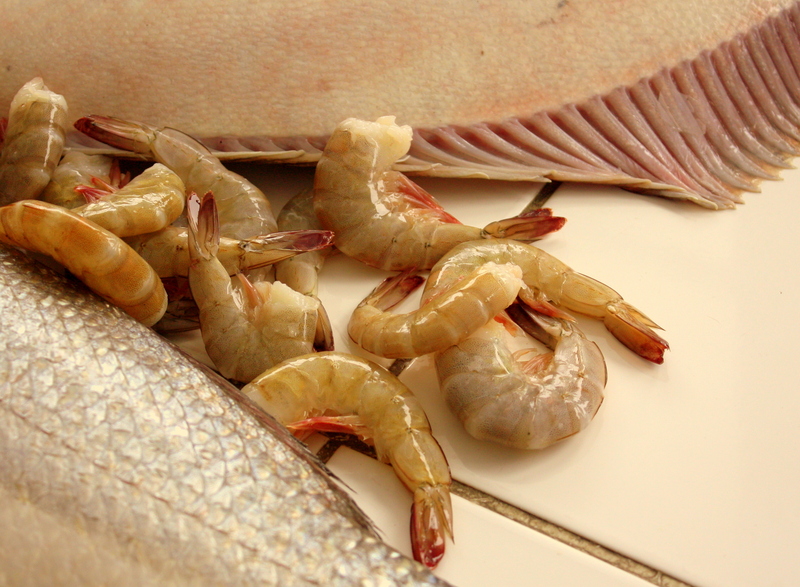 Next we visit the fishmonger, who shows us fresh fish and shellfish, explaining what to look for in the best seafood. A photo on the back wall of his stall shows him at the same work more than twenty years ago. We arrive at the Embarcadero 41 restaurant well before the lunch so that the staff can give full attention to explaining and demonstrating their preparations, then guiding foodies through a hands-on preparation of their own. 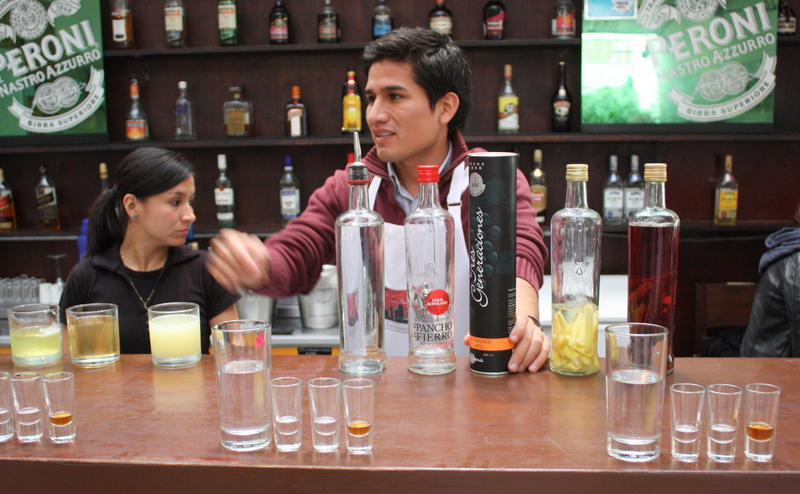 First we stop by the bar and the restaurant’s cocktail artist for the secrets if Peru’s Pisco Sour. Pisco is a grape brandy that reminds me a lot of grappa, but it’s made without the skin of the grape and packs a seductively smooth the punch. We taste some aged and infused varieties of pisco, but it’s the crystal clear version that’s the star ingredient in Perú’s national drink, the Pisco Sour, which combines pisco, fresh lime juice, simple syrup, and egg white, shaken and chilled into a frothy concoction. The star attraction at Embarcadero 41, though, is the ceviche. This restaurant is so fanatic about the using the freshest fish in its ceviche that it closes after lunch rather than serve the morning’s catch for dinner! The chef walks us through the preparation before we get to make our own. I’ve had ceviche all up and down the Pacific coast, and Lima’s ceviche indisputably puts them all to shame. 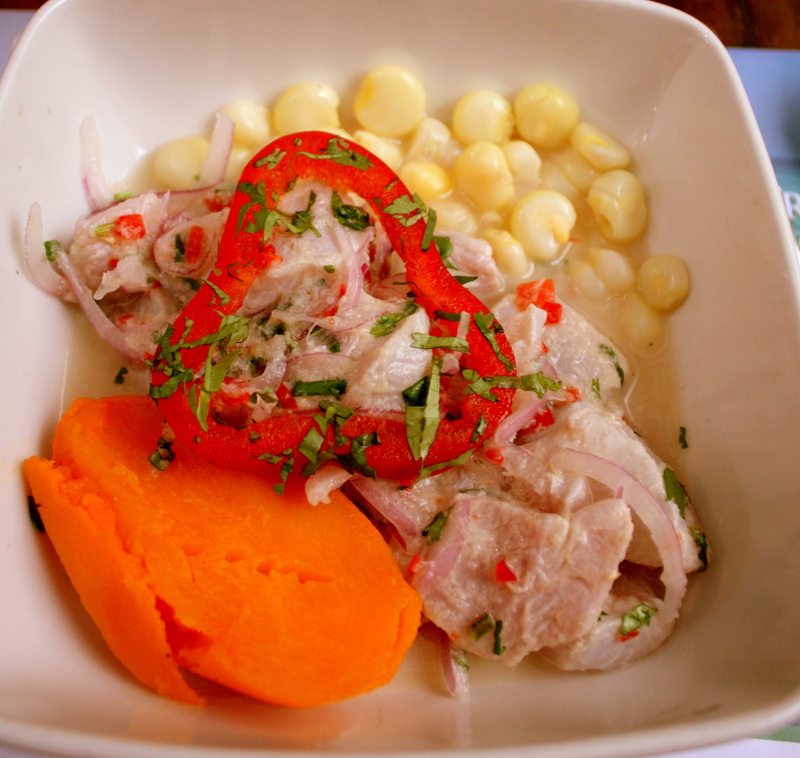 They use only white fish, and it’s served along with Perúvian corn and yam, and garnished with red pepper. Ceviche, though, is only the appetizer. 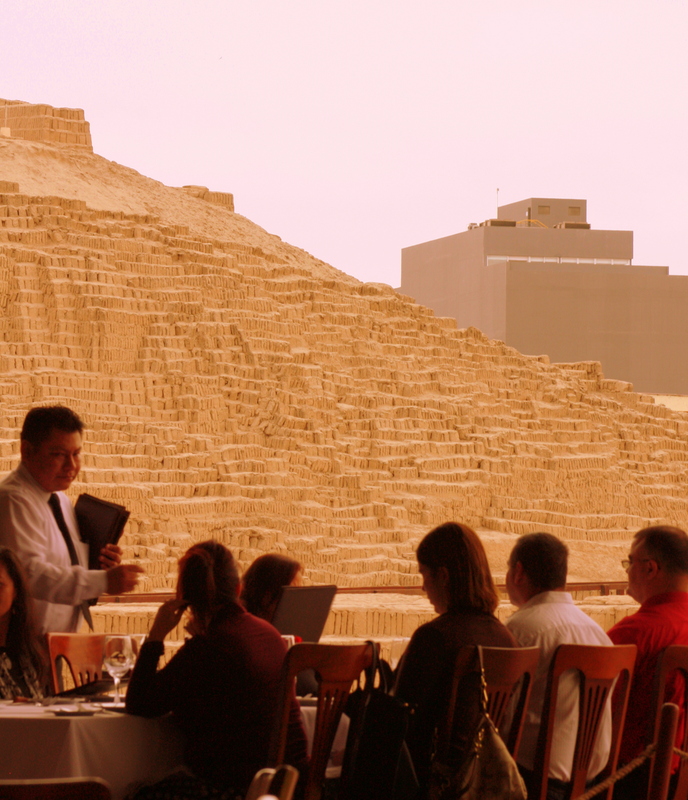 Today we return to the Huaca Pucclana ruins visited yesterday, but this time to the restaurant of the same name which sits at its doorstep, where the food is as incomparable as the setting. The waiter presents us with sampler portions of more items than we could otherwise possibly eat. It’s almost impossible to pick a favorite from among the entrees (although the Beef Heart may have been the first among equals!). Causa Rolls, made of yellow mashed potato stuffed with avocado and salmon. Beef heart with fried corn. Broiled scallops with parmesan cheese and lemon butter. Barbecued octopus on native potatoes, fava beans and corn. 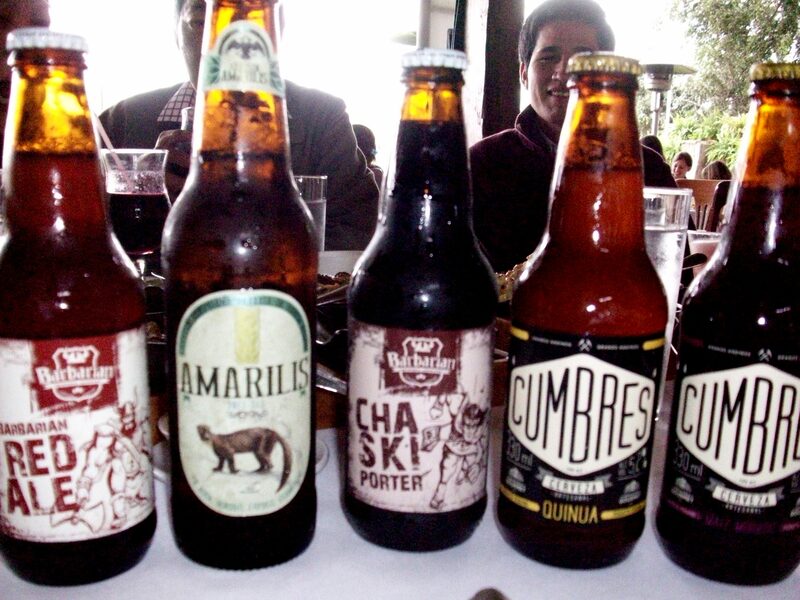 Selections from Peru’s Cumbres microbrewery. We chat with the sommelier about Perúvian wines, but I can’t resist asking about craft beers, and I’m glad I did. I end up ordering one of each and inviting everyone at the table to join me in a beer tasting. Two uniquely Perúvian twists on the brew were most memorable. One is made from toasted quinoa, and the other is infused with the flavor of the chicha-morada which I had a chance to try in Ollantaytambo. 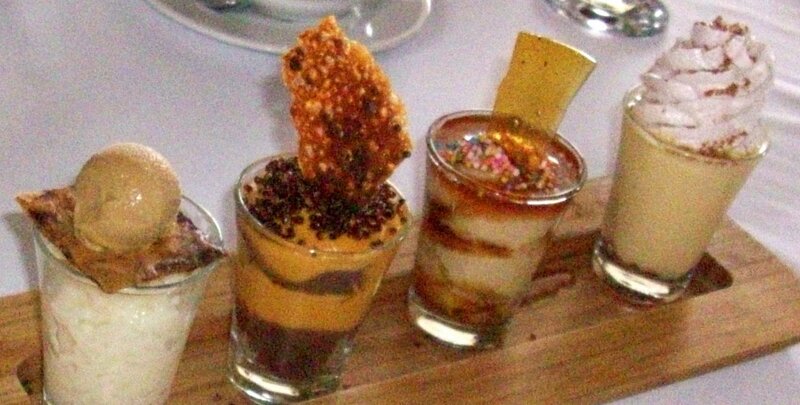 The dessert samplers are served up in shotglasses as “dessert shooters,” but if the portions were modest, the tastes were not. Warm rice pudding mille feuille and algarrobina ice cream. Lucuma mousse, crunchy quinoa, double chocolate. Suspiro de Limeña with port, cookies, and meringue. Cerveza Cumbres has no website, more info is available on its Facebook page. Sierra Andina is another Perúvian microbrewery that produces a good product in more traditional flavor profiles. 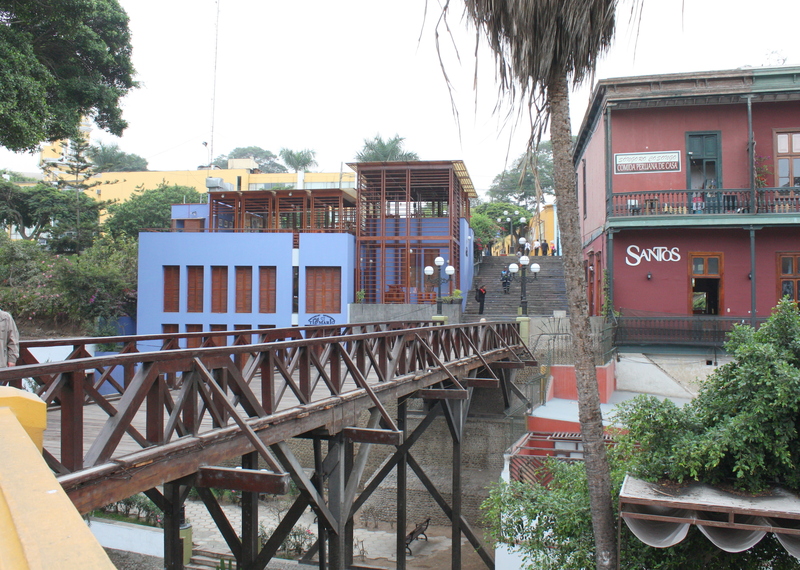 Barranco is the Spanish word for “ravine”, and Lima’s Barranco District takes its name from a ravine that was once a riverbed, but is now the site of a pedestrian walkway – the Bajada de los Baños – a ramp that connects it to the beach below. The forest of glittering high rises that has sprouted in neighboring Miraflores has not yet crept this far down the coast, and it still has the feeling of a village. 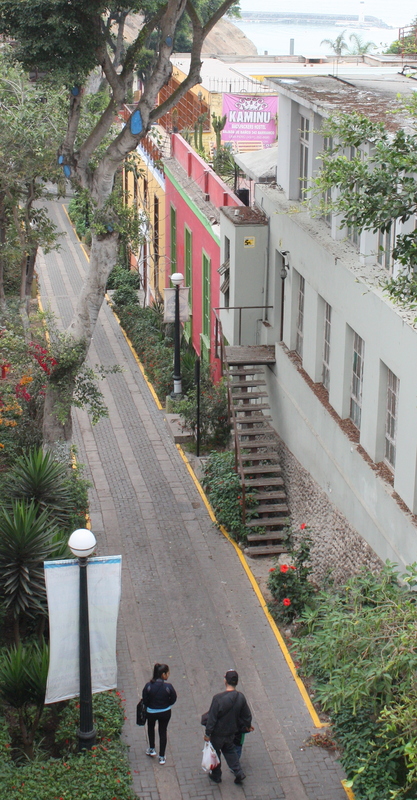 The ravine, though, is not the only unique feature of Barranco’s geography or its appeal. Cliffs extending out from the shoreline to the south shield it from cold and damp southern winds to create a comfortable micro-climate. On a side street, a hostel sign proclaims “backpackers welcome,” and through its open lobby door well-worn surfboards stand stacked against a wall. 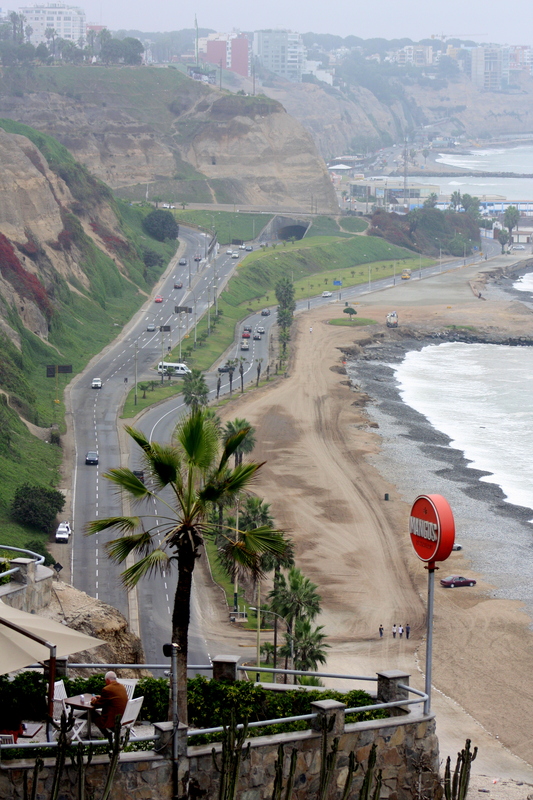 Lima has been ranked Number 6 among the World’s 50 Best Surf Spots, and Barranco still boasts a marina and yacht club. 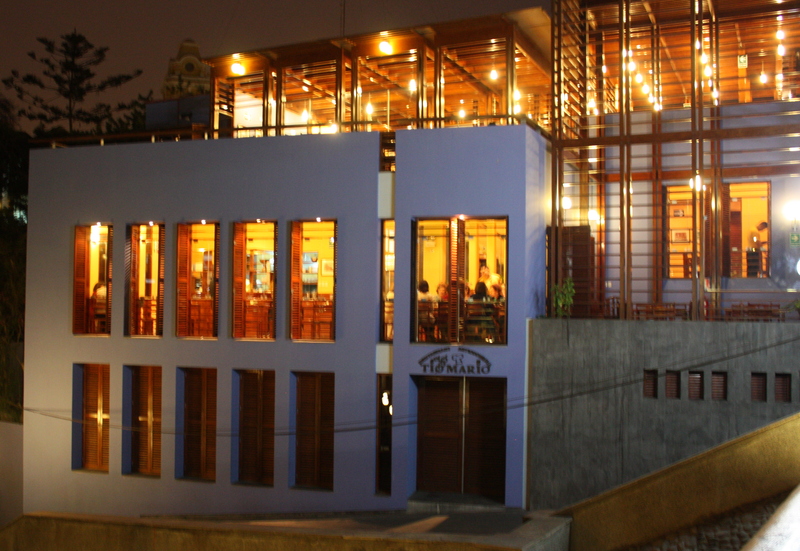 Barranco was originally a fishing village, and its maritime heritage is celebrated by the Eglesia de la Ermita. Legend has it that a group of fishermen lost in the sea mist at last saw a distant light and rowed toward it. When they came ashore, they found that in the spot where they had seen the light was nothing but a wooden cross in the sand, and built the church in thanksgiving. La Ermita is now abandoned, its fractured ceiling a exposing earthquake-proof construction techniques that date back to pre-Columbian times that substitute light and flexible bamboo and stucco for heavy brick or stone. Late 1800’s, the District became a fashionable beach resort where well-to-do Limeños built casonas – their summer homes. 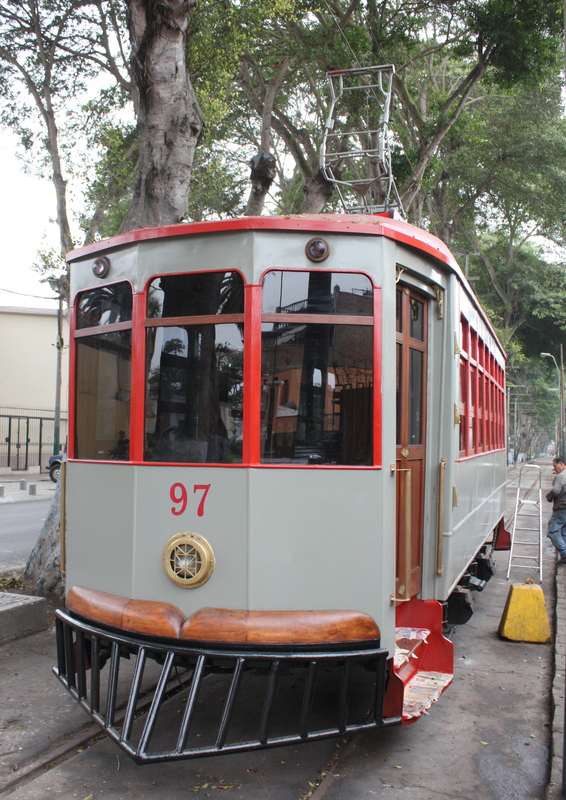 It was so popular that an electric trolley line once connected it to downtown Lima, and one of the trolley cars is now on display here as a permanent museum. 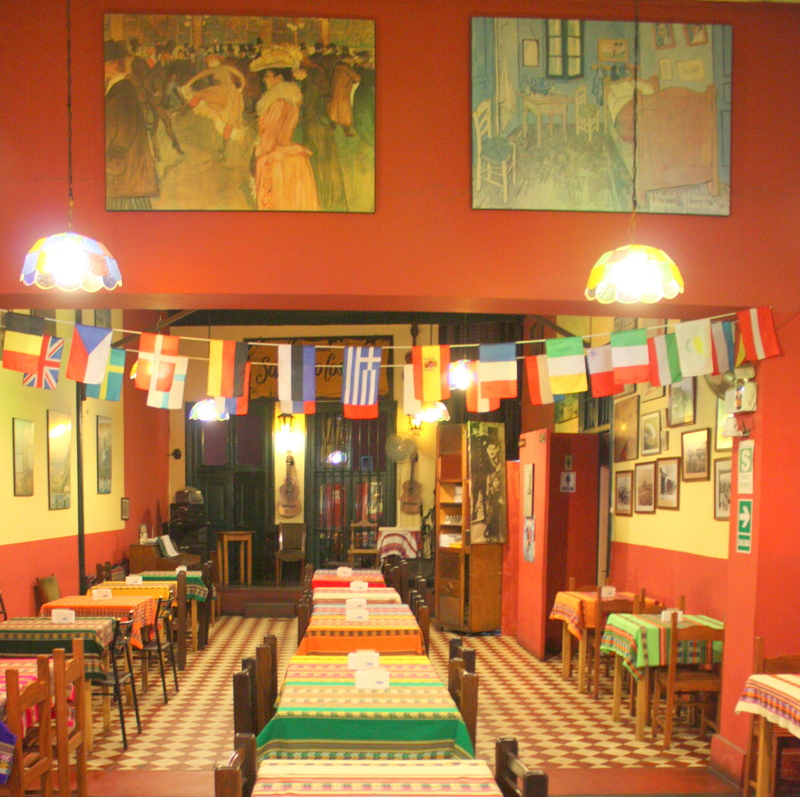 The District is also considered to be Lima’s most romantic and bohemian neighborhoods. 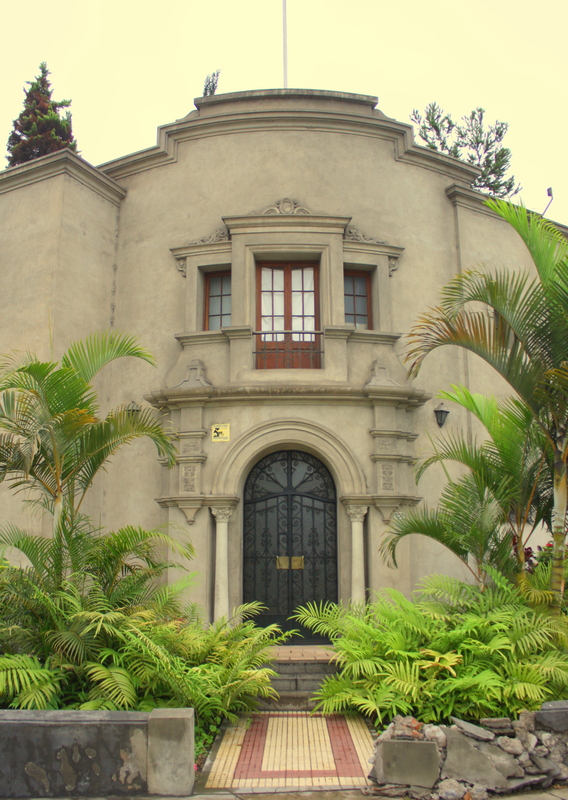 Peru’s leading writers, artists and musicians have lived and worked here for more than a century, and there are more than a dozen galleries here, including the first permanent exhibition of internationally known Peruvian fashion photographer Mario Testino. The heart of the District covers a dozen or so square blocks. It’s easy to cover on foot and very secure to walk. 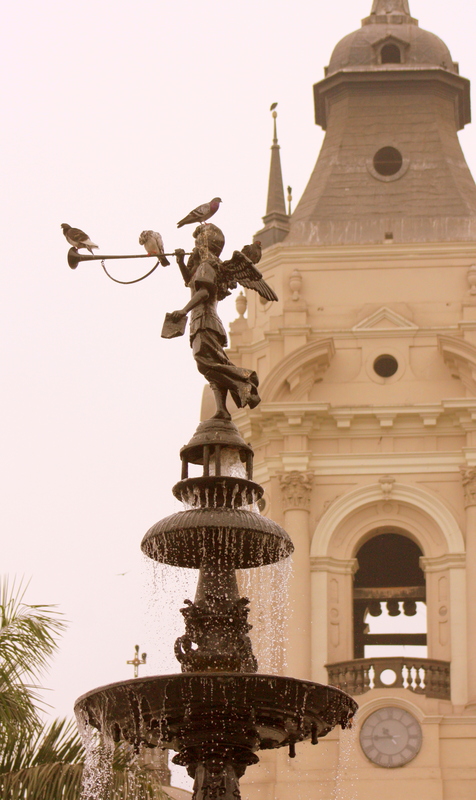 The central plaza retains its original Spanish colonial flavor, and parks and streets are flower-filled. Shops sell artisan goods tapestries and ceramics. Street art adorns walls and homes. 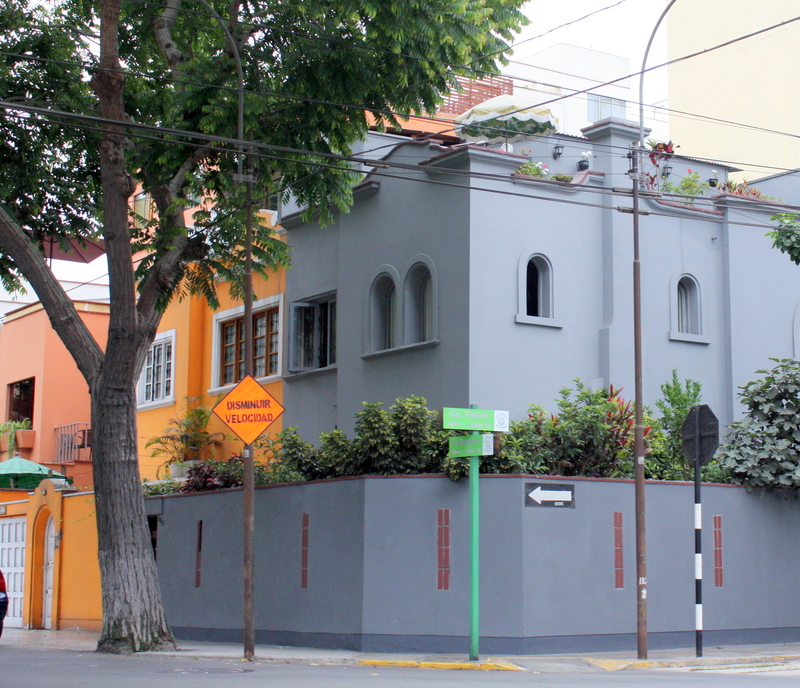 Facades of casonas built in the Republican style retain all of their elegance and charm. 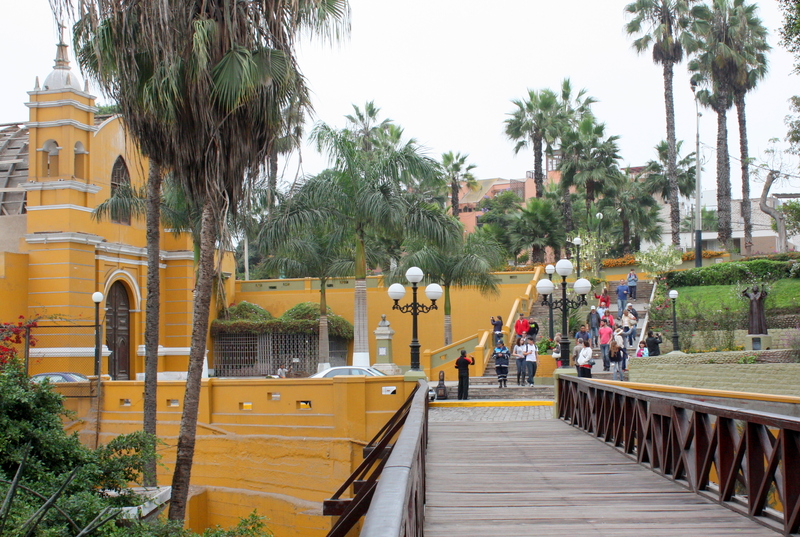 The walkway to the sea, the Bajada de los Baños, is spanned by the Puente de los Suspiros foot bridge. Its name translates into Bridge of Sighs, so called because it is a frequent meeting place for lovers. Here you’ll find no chain restaurants, but only owner-operated establishments, each brimming with its own unique charm. 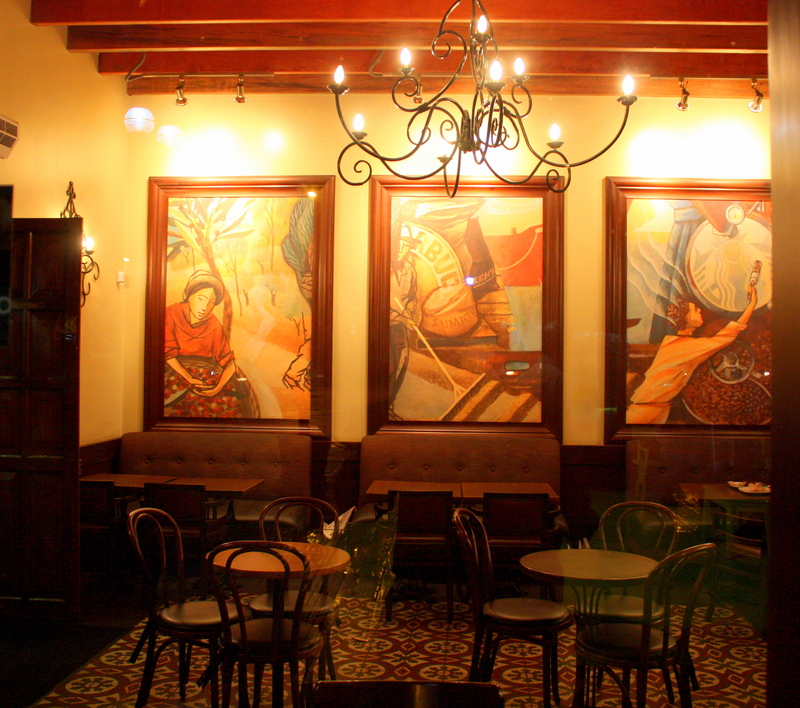 If Barranco is a pleasant way to pass the day, it comes even more alive in the evenings, when the bistros, bars, and cafes are crowded with young adults. 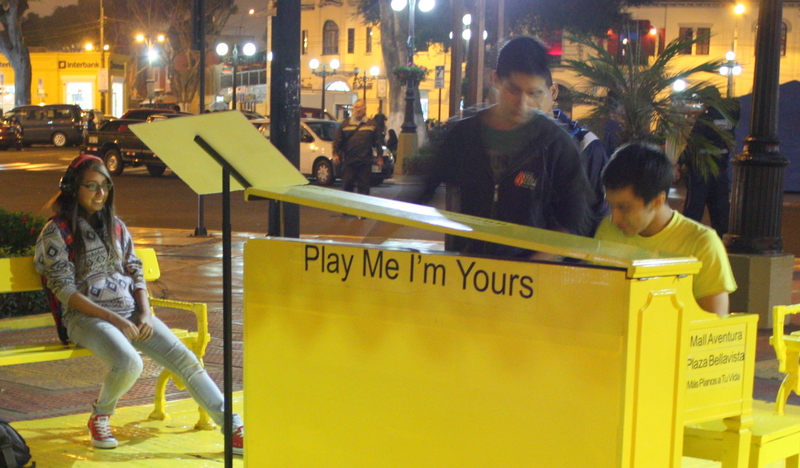 I settle over a latte to watch passers-by stop to play a piano that sits beneath an outdoor canopy. It’s only one of dozens placed in city parks and other public spaces by the city, and I sit nearby as a young man plays a flawless rendition of a work by Debussy. It’s a perfect end to a perfect day, but I’m still looking forward to tomorrow’s culinary tour of Lima! Click here to come along! Evidence of pre-Inca cultures beneath Lima was unknown to Francisco Pizarro when he selected it as the capital of the Spanish viceroyalty of Perú, and the new capital barely survived its first year. 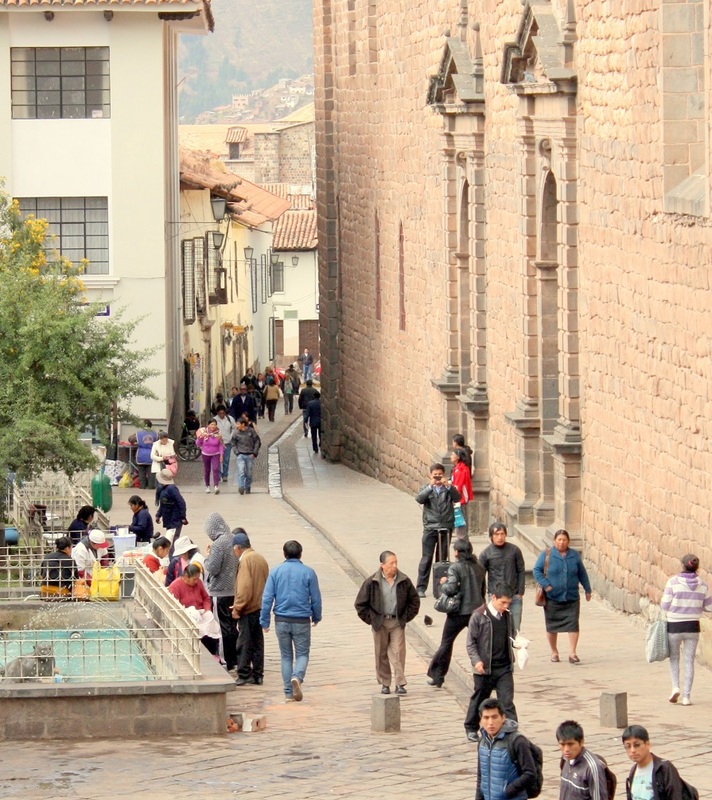 In 1536, the army of Inca Emperor Manco II nearly wiped the city from the map during his 8-year insurrection. 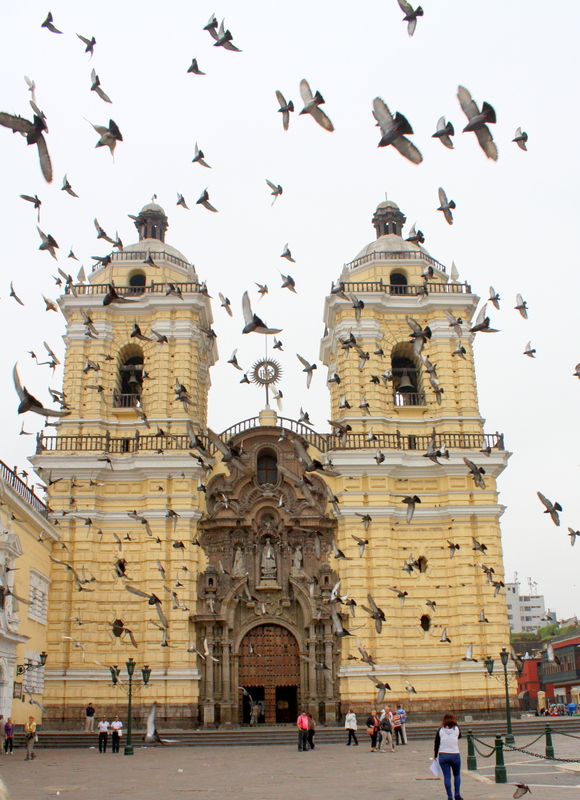 The Plaza Mayor, focal point of is Lima’s Centro Historico, is one of Peru’s dozen UNESCO World Heritage sites. It’s bordered by buildings constructed in the Spanish colonial style that include the Presidential Palace and Lima’s central Cathedral. Pizarro ordered the first Palace built shortly after the Conquest in 1535. As elsewhere in Perú, the Spaniards placed it on the site of an Indian burial ground and shrine. 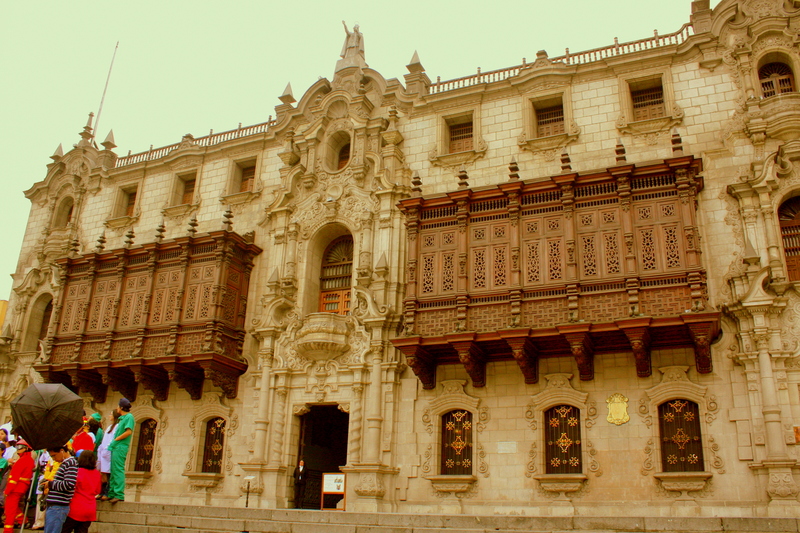 The Palace and its successors were the residence of Spanish Viceroys for nearly three hundred years, and later as independent Perú’s seat of government. 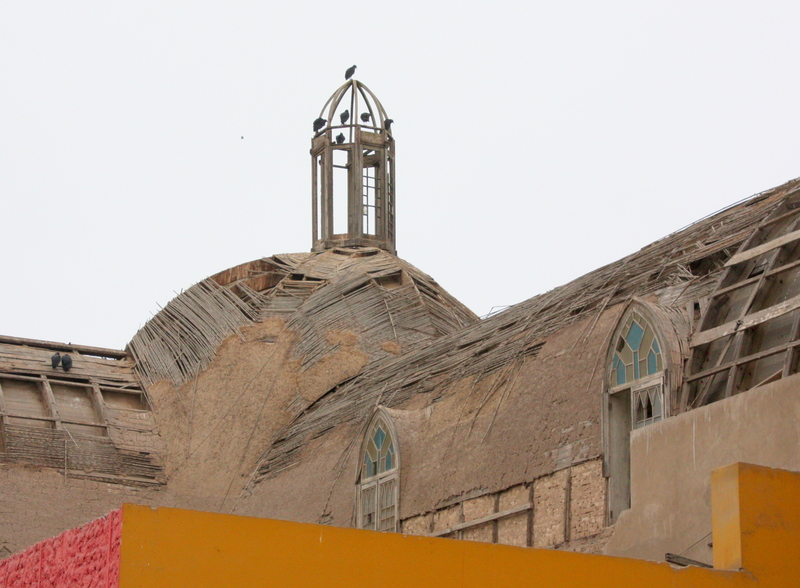 The current structure, built in the French Baroque style, was constructed in 1921. 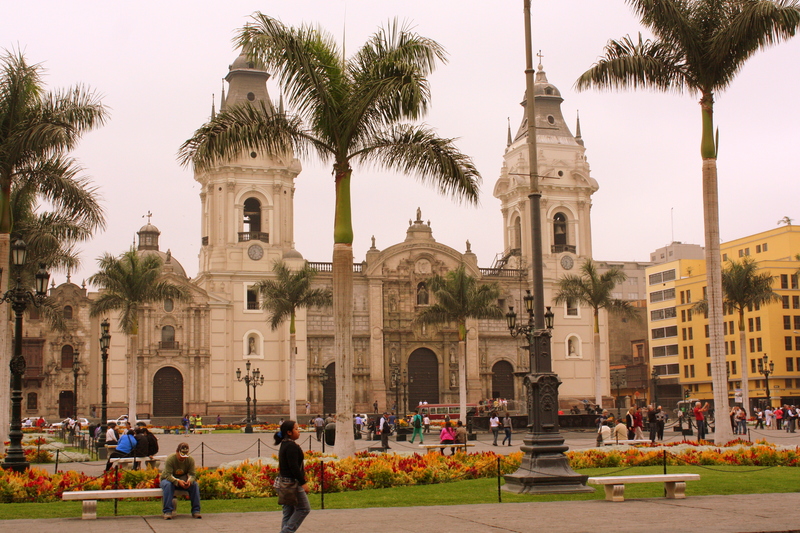 The Basilica Cathedral of Lima is the third church erected on its site. Pizarro ordered the first one built in 1541, and it was constructed of wood and adobe. He was assassinated within a year and buried within the Cathedral’s walls in an unmarked grave that went unidentified for nearly two hundred fifty years. 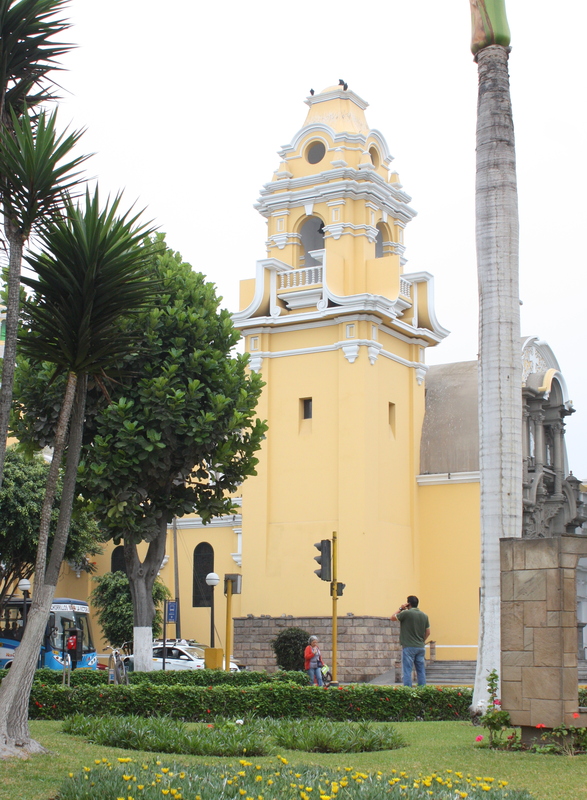 The Cathedral has been the seat of the Lima Archdiocese since 1546. It contains more than a dozen chapels, and has survived partial destruction by at least three major earthquakes, most recently in 1940. 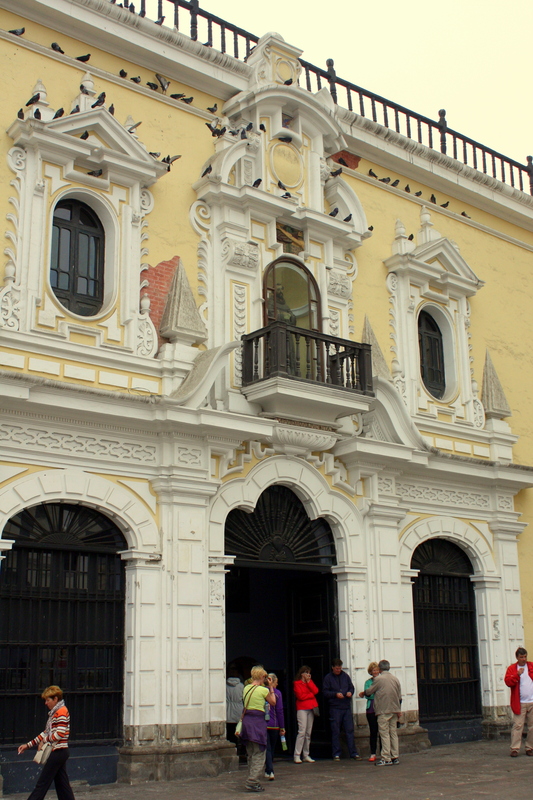 Ornate balconies of hand-carved wood, a signature feature of Lima’s colonial architecture, are prominently featured on Plaza buildings, most notably on the Archbishop’s Palace. 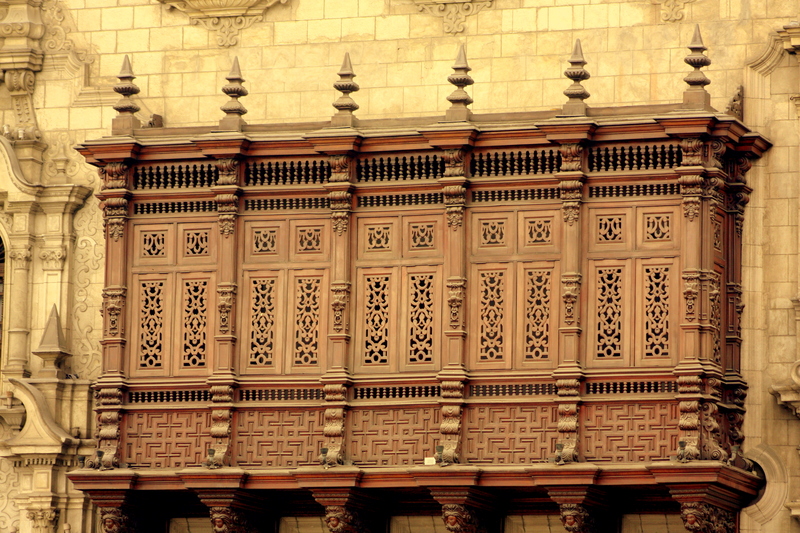 The balconies’ design, of Moorish origin, reflects the contribution of yet another influence on Peru’s melting pot culture. 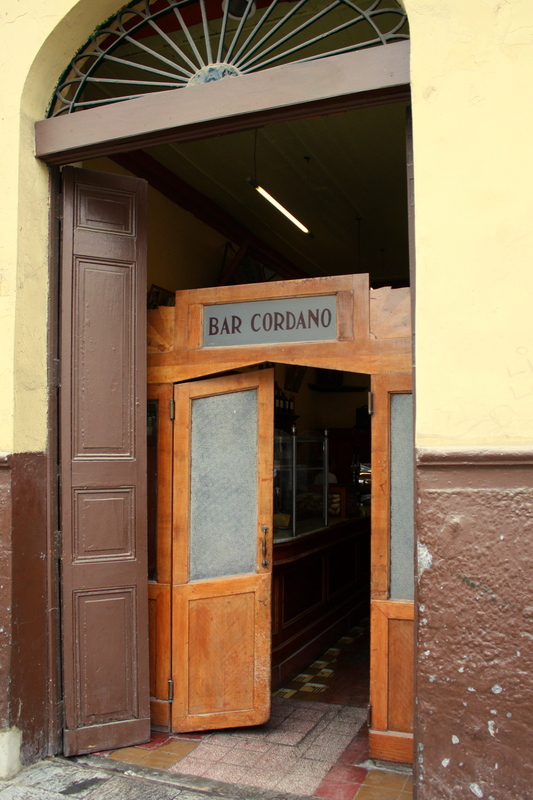 The Convento de San Francisco is only a two block walk from the Plaza Mayor, but the route passes by a picturesque cafe and bar that’s too irresistible to pass up. Two spectacular features of the Convento de San Francisco make it a must-see, and since interior photography is prohibited, it can only be experienced in the flesh. One is a staircase cupola fashioned from Nicaraguan cedar in exquisite, Moorish-inspired patterns. The other is its ossuary, an extensive catacomb from which archeologists have exhumed for display the bones of tens of thousands buried within the convent over the centuries. Between the Centro Historico and Miraflores, foundations deeply dug for Lima’s new high rises have revealed ruins and relics of pre-Inca culture. 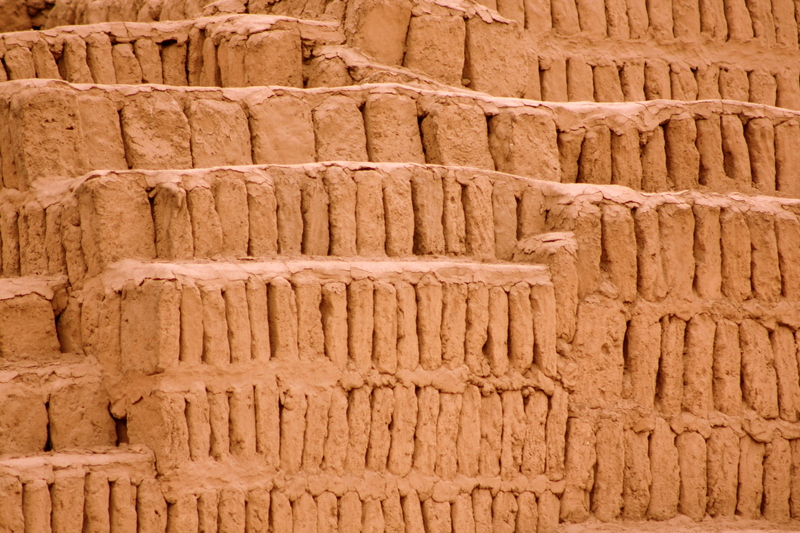 The Huaca Pucllana is a great adobe and clay pyramid of seven staggered platforms. It first appears out of the surrounding mid-rises as a dusty mound enclosed by chain link fence and marked by the trails of dirt bikers who once used the site. It covers an area nearly three city blocks wide and five long. Excavation is ongoing. 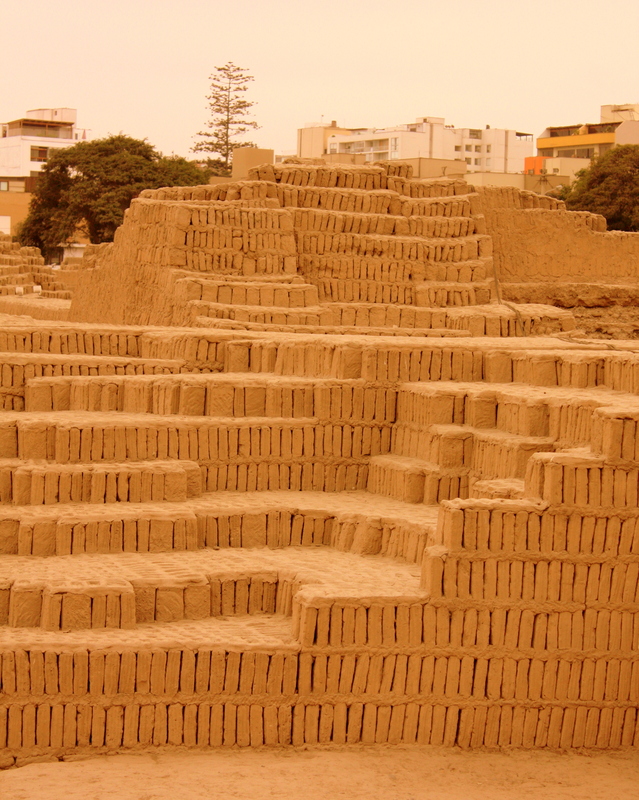 Huaca Pucllana was a major ceremonial and administrative center of the Lima Culture, a coastal society that flourished at the same time that Europe was descending into the Middle Ages. One part of the complex contains pits where offerings of fish and other marine life were once made to curry the favor of the gods. The other was an administrative area which contains adobe structures among which some walls are still standing. Also uncovered here are relics of the earlier Wari Culture, including the first of their tombs to be discovered completely intact. Its three burial shrouds held the remains of three adults – one of high station – and those of a sacrificed child. With only two days of this trip remaining, I’ve begun searching for the threads that run through all that I’ve seen in Perú. One of the headlines is this: A Perú visit which ends with Machu Picchu and the Sacred Valley of the Incas is like seeing the ruins of ancient Rome without its Greek predecessors or the European cultures subsequently built upon it. 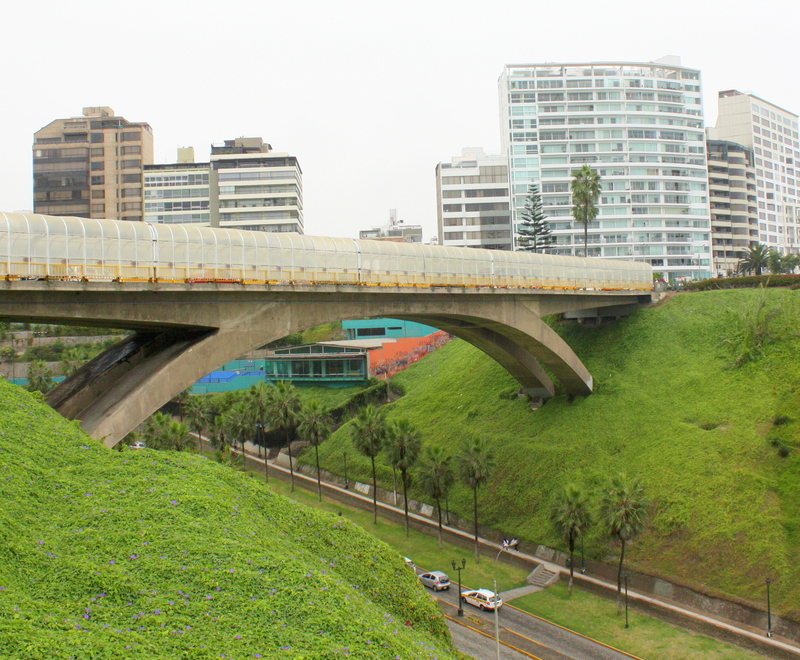 “Suicide Bridge” in Miraflores District, Lima. Fences later installed prevent future jumps. Machu Picchu visitors who treat Lima as no more than an airline connection are missing an essential part of the Peruvian experience. 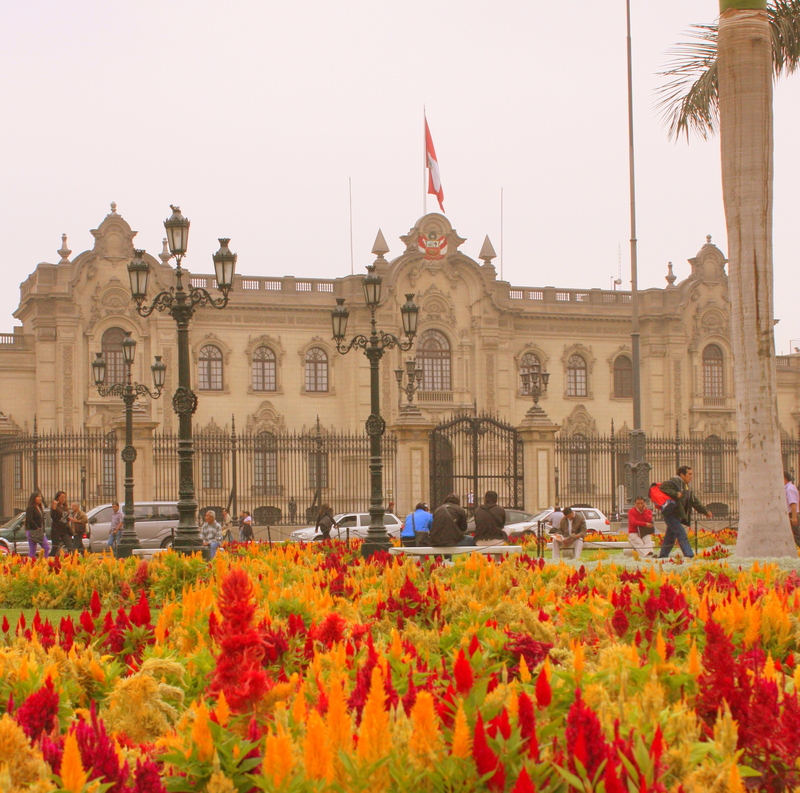 There is easily enough to see and do in Perú’s capital to warrant spending a couple of days. Lima is the only capital city in the Americas that sits directly on the Pacific coast, and the distinction has markedly shaped its culture. 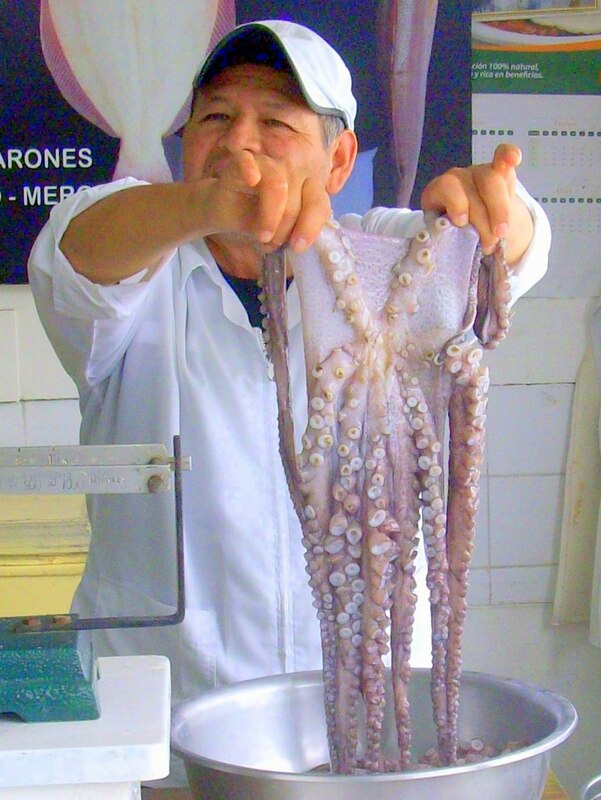 Fresh seafood, meticulously prepared and served up in eye-popping presentations, is widely available, and here in the land of its origin, the ceviche is incomparable. The Cantonese-Peruvian fusion cuisine known as “chifa” has its origin in Chinese immigrants who came as railroad builders and agricultural workers around the turn of the twentieth century. Today the Chinese commercial influence is evident in everything from consumer goods to the maker’s mark on the city’s busses. 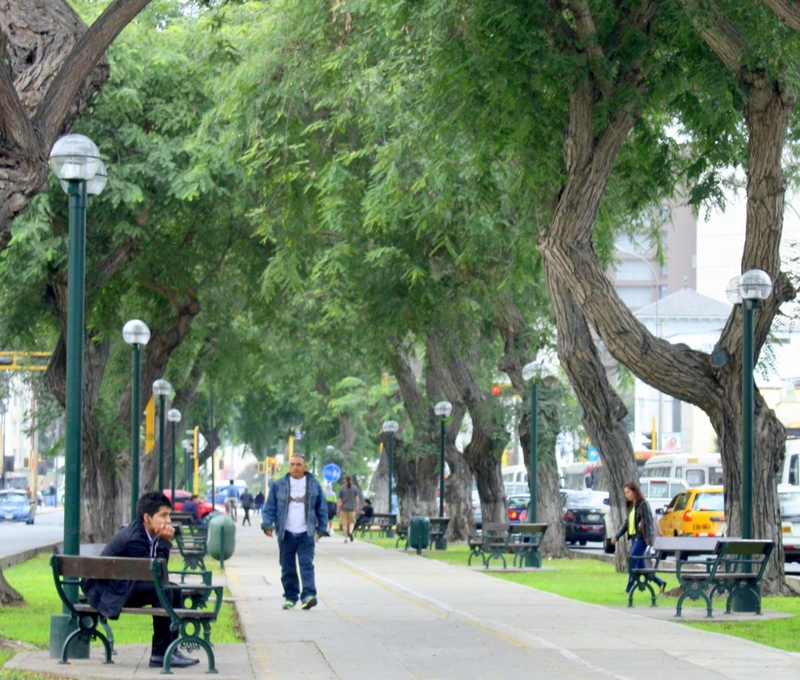 In the fifteen years since the government prevailed over the Sendero Luminoso and Túpac Amaru terrorists, Lima has enjoyed a stability and increasing prosperity that’s visible everywhere. The Limeños I talked with not only shared the belief that their lives were better than ten years ago, but that they felt optimistic about their futures. The new prosperity has spawned world-class restaurants and hotels clustered around charming residential neighborhoods that range in architectural styles from historic to contemporary. 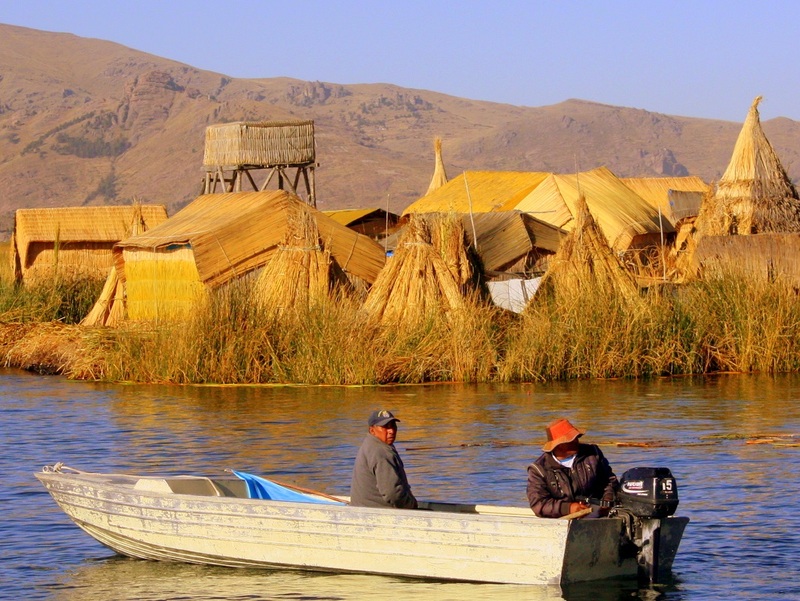 The prosperity is also fueling highway improvements and flood control projects throughout Perú. In Lima, improvements include a subway system on which ground is newly broken, and ongoing land reclamation that continues to extend a string of public beachfront parks already close to ten miles long. Whether you choose to walk, job, cycle, or surf them, their pull is irresistible. 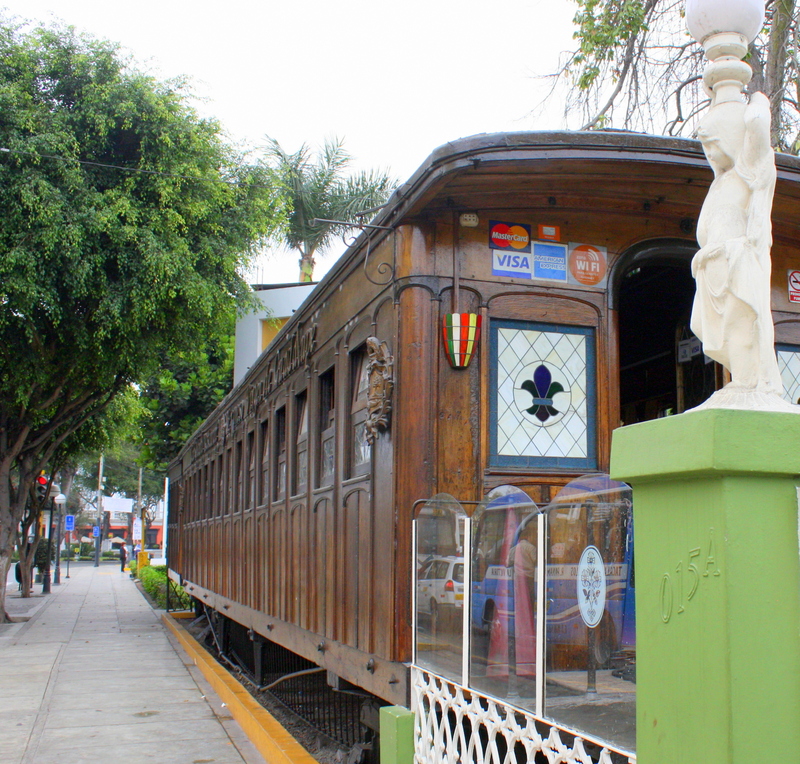 The Miraflores District, situated south of the city center along the coast, is home to some of the city’s most elegant and historic homes. More recently built high rises and townhomes reflect the new prosperity. The neighborhood is clean, secure, and eminently walkable. It’s also home to some of the city’s best restaurants and hotels. English is spoken in most of these. and staff is consistently friendly and helpful. Lima is 800 miles south of the equator, so it’s autumn during this May visit. While skies are often overcast, evenings require only a light jacket or sweater. 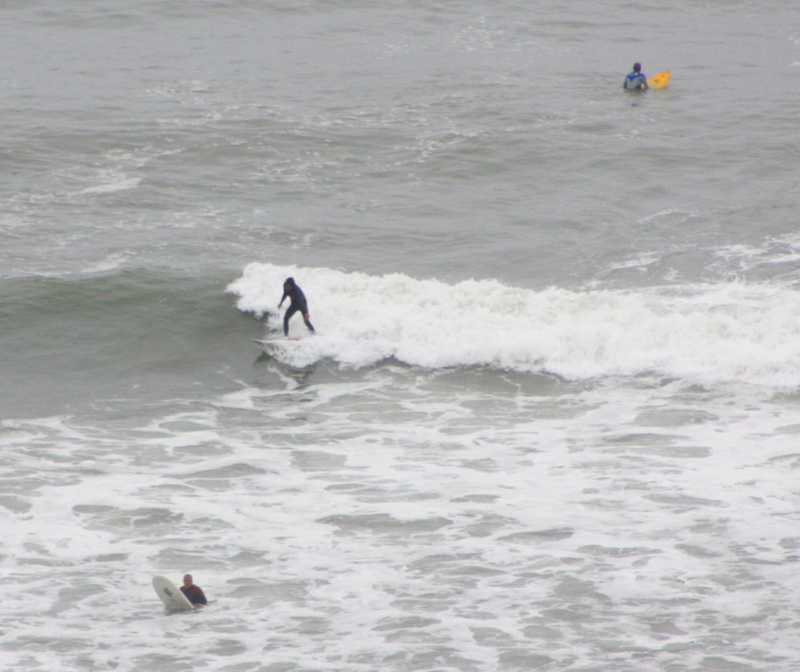 Not so for ocean temperatures, and the surfers are all wet-suited. 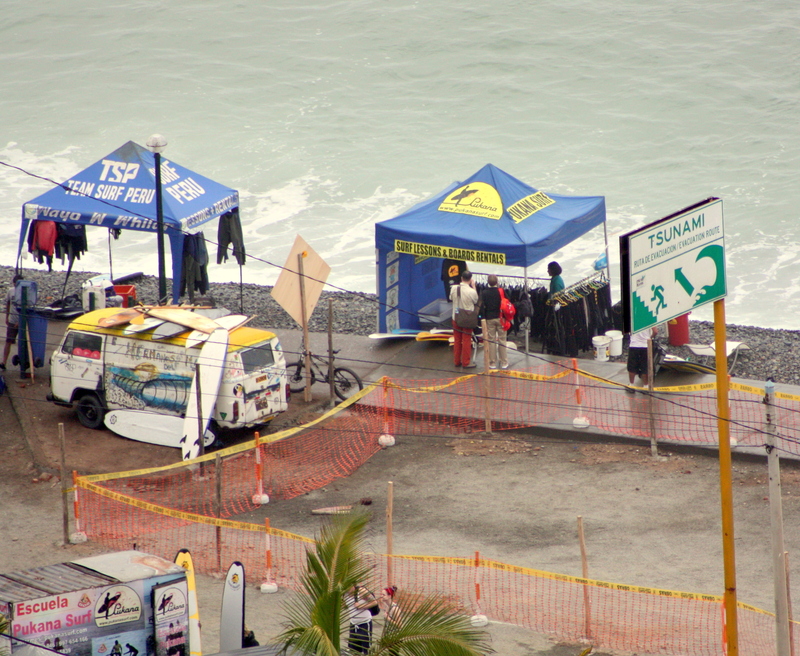 Surfers suit up only feet away from a tsunami escape route sign. Tsunami escape route signs all along the beach below remind all of the ever-present danger. 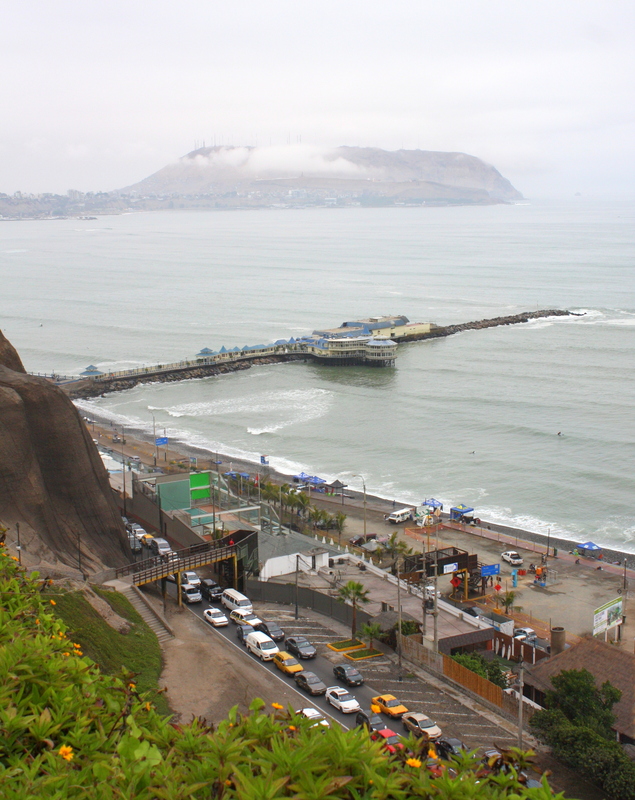 Lima hasn’t experienced a tsunami since the 8.2 magnitude earthquake of 1940. 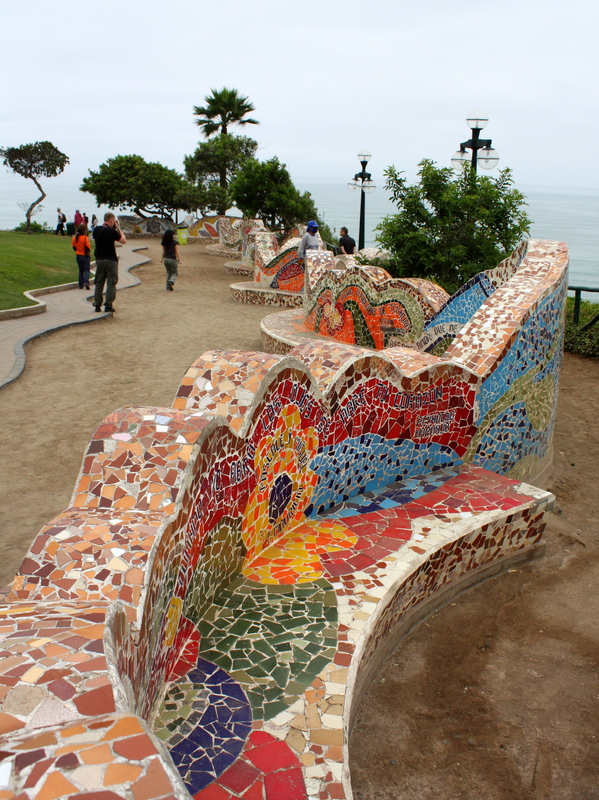 In Miraflores, the beachfront parks are mirrored by parks strung along the cliffs above. Visitors will be wowed not only by Larcomar Mall‘s selection of eateries and chic shops, but by its stunning ocean overlook. 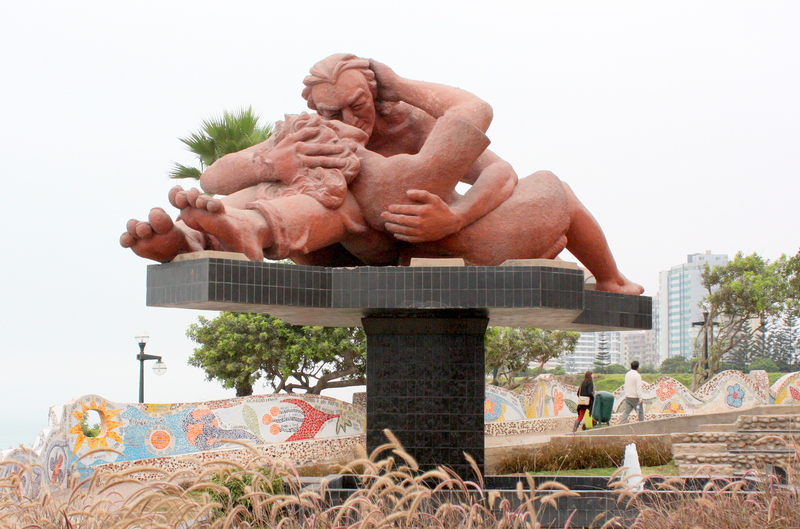 “The Kiss”, by sculptor Victor Delfin, in the Parque Del Amor on Lima’s oceanfront. Not far down the beach, the centerpiece of the Parque del Amor, opened on Valentine’s day in 1993, is a Victor Delfin sculpture of lovers in passionate embrace titled “El Beso”. Posted nearby is a quote by poet Antonio Cilloniz in which he laments that cities build monuments to warriors, but never to lovers. 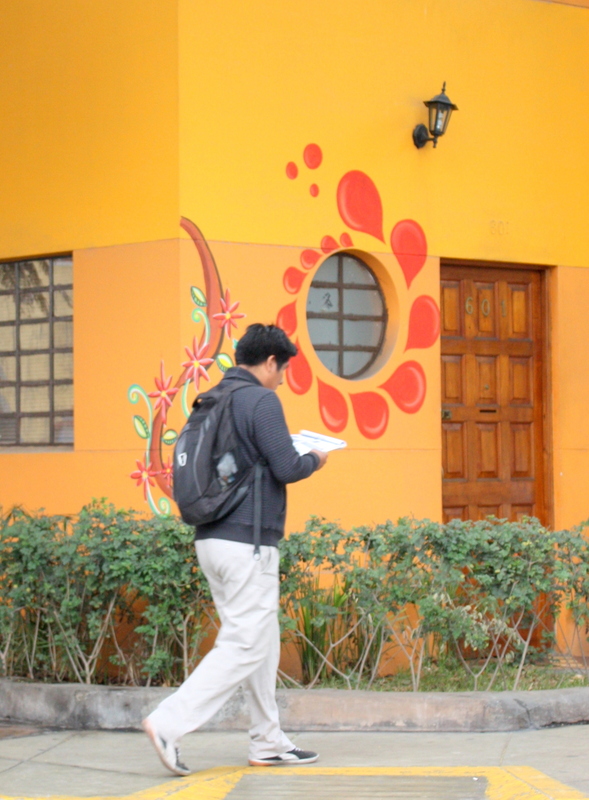 Peace and love – paz y amor – is a recurrent theme throughout Peru. In the San Miguel District, a statue of John Lennon holding a guitar stands in his namesake park, and tiles in a mosaic circle at his feet spell out the work “Imagine”. 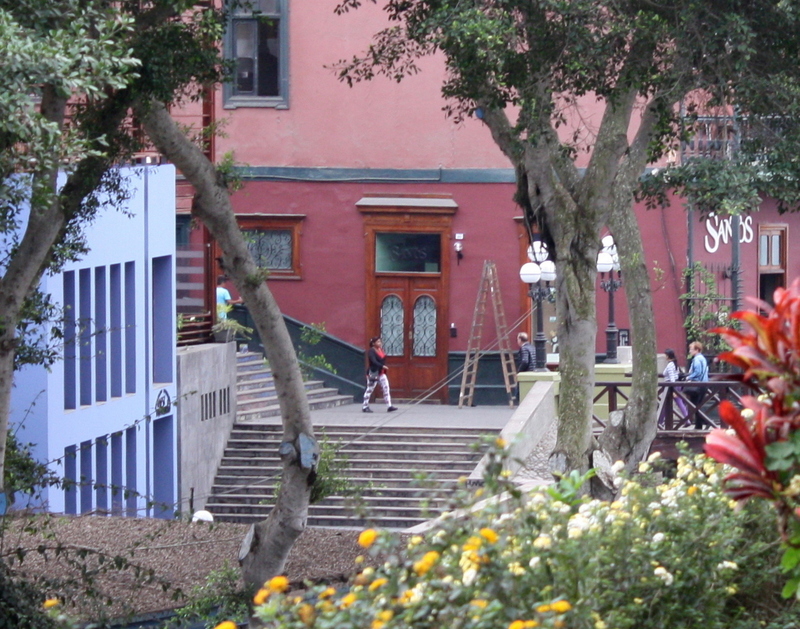 Next to Miraflores’ municipal park at Larco and Diagonal Residents is Kennedy Park, known in the city for it stray cat population. Here, neighborhood cat lovers “sponsor” a cat by paying for spaying, neutering, and vaccinations. Residents have also been known to adopt strays long enough to give them a bath and a few square meals before returning them to the park for adoption by others. Lima traffic is a robustly chaotic affair in which any intersection not marked with a traffic light is a free-for-all. It’s all the more challenging because horn-honking was forbidden by a former mayor who considered Lima’s ear-splitting street noise off-putting to tourists. It’s best to rely on local drivers to navigate its formidable currents. Be forewarned, though, that with curbside parking space at a premium there are no taxi stands – and because the government does not license or regulate taxis – it’s best to arrange transportation through your hotel, restaurant, or tour operator. 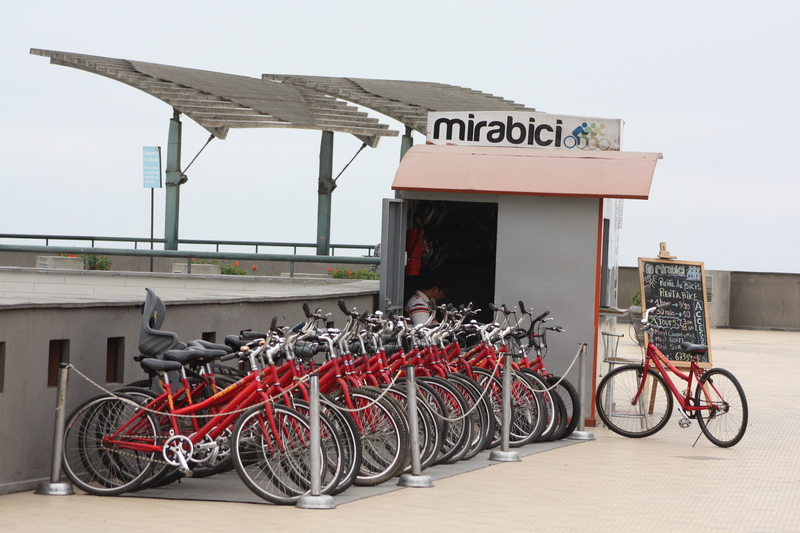 It’s taken a full day to explore Miraflores, but there’s plenty of Lima yet ahead, beginning with a visit to Lima’s Centro Historico. Click here to come along! Machu Picchu is the first image which comes to mind at the mention of the word Perú, but any visitor who limits a tour of this incredibly diverse country to the iconic ruin will only scratch its surface. 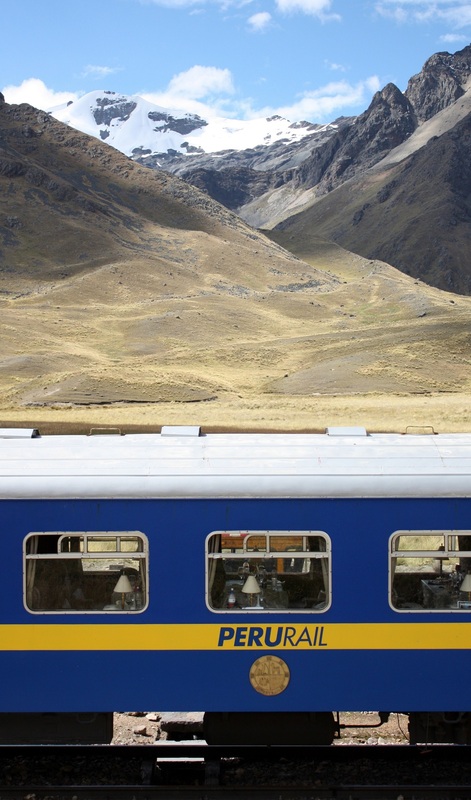 In fact, the real dilemma in planning a tour of Perú is not what to leave in, but what to leave out. Archeological sites in the Incas’ Sacred Valley which tell which the story of the Incas’ rise and fall are a tour essential, but a visitor could easily spend a month elsewhere without retracing any steps. Peru is large enough to stretch from the U.S.\Canadian border to the Gulf of Mexico. Terrain ranging from Pacific beaches to mountain peaks and rain forests has spawned dozens of micro-climates that produce a staggering and often unique array of plant and animal life. 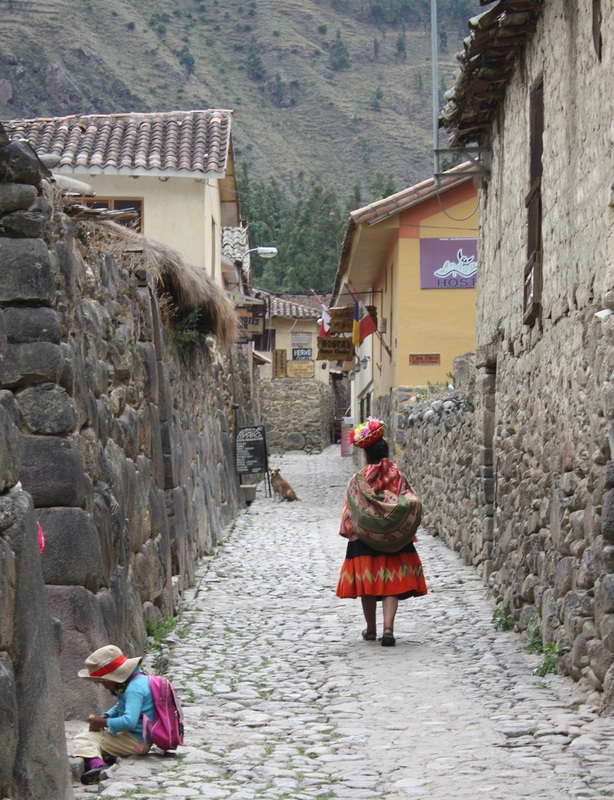 The Quechua language spoken by the descendants of the Inca is only one of a dozen languages spoken by nearly 100 indigenous tribes and clans, each with their own distinctive dress and customs. The Incas’ Sacred Valley, from Cusco to Machu Picchu. 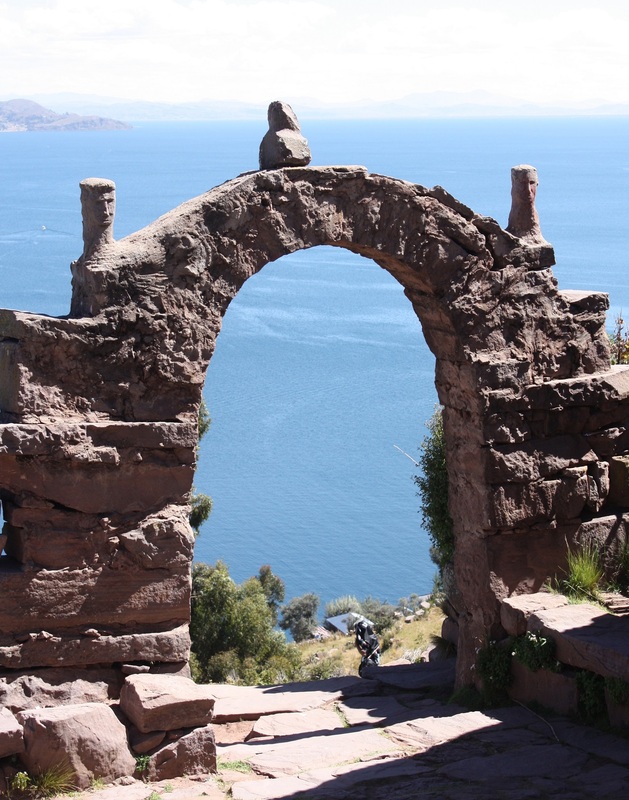 Lake Titicaca, arriving via stunning views from the Andean Explorer train, with service that hearkens back to the golden days of rail travel. Perú’s oceanfront capital Lima, brimming both with Spanish colonial charm and glittering high rises towering above gardens, promenades, and world-class restaurants. Security is outstanding. The streets feel safe and police are rarely out of eyesight wherever tourists most often gather. Wireless is widely available in cafes, restaurants, and hotels in areas most frequented by tourists. Electricity is 220 volts, so an adapter for 110 volt appliances is a must unless you intend to turn them into a toasters. Consider whether you’ll also need a 3-to-2 prong outlet adapter; most electrical outlets are ungrounded (2-prong). Take altitude very seriously unless you want to spend a day of your vacation in a clinic. Thin, dry mountain air means less oxygen, faster dehydration, and less protection from the sun. Make the going easier with a hat, long-sleeved shirts, sun block and sunglasses, lip balm and skin moisturizer and water, water, water. Consider also taking along an altitude medication such as Diamox. The coca leaves and tea which are widely available in hotels reflect the centuries-old practice and learning of Andean peoples, and they know what they’re talking about. Not every site is ADA compliant. Visitors with mobility issues can have a fulfilling experience, but many of the archeological and many cultural sites require a good walk or climb to be fully appreciated. 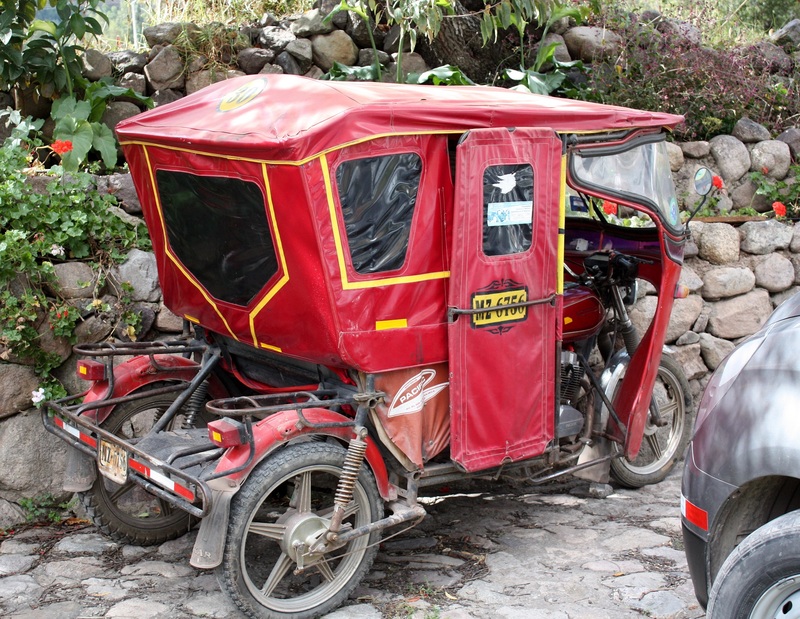 Use of shared transportation or a taxi for ground travel anywhere in Peru is highly recommended; traffic both in the city and in the countryside is an organized chaos, the rules of which defy comprehension by the uninitiated. And, of course, take your camera; the stunning landscape and picturesque people make it practically impossible to take a bad photo.